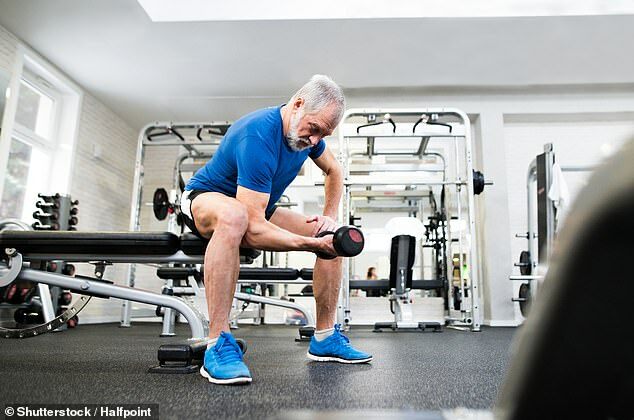 Older people who lift weights in the gym will live for longer, if new scientific research is to be believed. But they will only have lower odds of being sent to an early grave if they lift weights quickly and in moderation – and they must avoid heavy ones. Each participant was assessed for how many times they could lift weights that were gradually getting heavier in the ‘upright row’ position in a certain time frame. Researchers found that at a follow-up after six-and-a-half years, 247 men – or 10 per cent – and 75 women – or six per cent – had died. But gym-users who lifted the heaviest weights – defined as having the most muscle power -were up to 13 times more at risk of dying. Muscles get gradually weaker as people age and it’s a common contributor to death in people over 40. Professor Araújo said: ‘Rising from a chair in old age and kicking a ball depend more on muscle power than muscle strength. ‘We now show that power is strongly related to all-cause mortality. Choose a weight that isn’t too easy or hard to lift, they added, and said to do up to three sets of six to eight repetitions moving the weight as fast as possible. The findings were presented today at EuroPrevent 2019, a congress of the European Society of Cardiology, in Lisbon, Portugal. 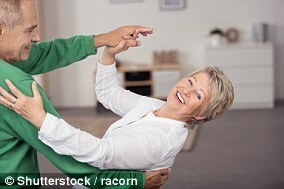 IS BALLROOM DANCING GOOD FOR ELDERLY PEOPLE? Elderly people are advised to take up tango and ballroom dancing to cut the risk of falling and injuring themselves. In June 2017, dance scientist Dr Emma Redding, from Trinity Laban Conservatoire of Music and Dance, said dance classes could help prevent falls, which are the biggest cause of emergency hospital admissions for pensioners in Britain and kill almost 5,000 people every year. The slower, structured dance styles of tango and ballroom provide ankle and core strength for older people, helping them keep their balance. Older people are more at risk of falling because of muscle deterioration and a loss of balance that comes with age, as well as sight problems and the side effects of medications. Dr Redding also said dance classes can help widowed people who are lonely, while the traditional music they waltz to can bring back valuable memories for those with dementia. Speaking before giving a talk at Cheltenham Science Festival, she said: ‘Dancing, you take physical risks you would not on your own. You shift your weight from side to side, from front to back, as you would not do when walking. ‘This helps with ankle and core stability and makes people much more confident when moving in everyday life. Dancing burns off six calories a minute in the average person, compared to 10 calories a minute for football. This is particularly good for older people, who typically fail to achieve their guideline 150 minutes of moderate exercise and two of more days of strength exercises a week.